In early summer, the pastures on the Kauber Platte high above the river Rhine are lush and green, rich in herbs and minerals. 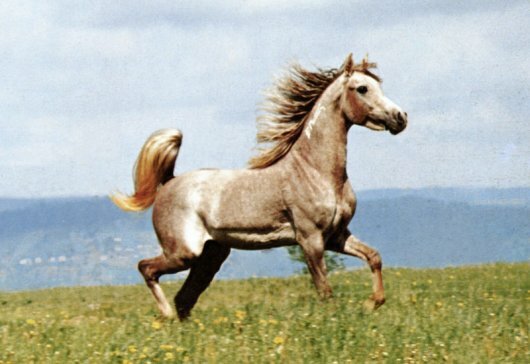 But during dry summers, they may begin to resemble the original desert home of the Arabian horse. 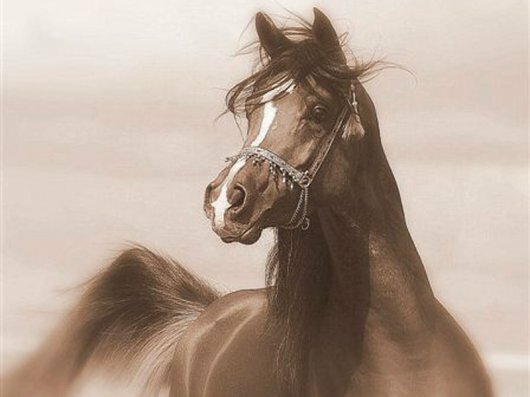 It is a combination that has proved beneficial for the preservation of type in the straight Egyptian Arabians that have been bred here for almost 40 years. 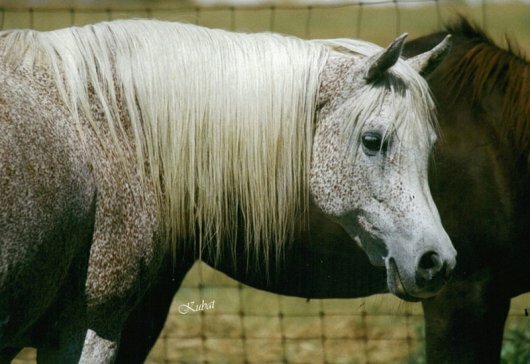 The stud was founded at the beginning of the 1970s with some Arabian mares of Marbach bloodlines, but they did not have a lasting influence. The original foundation mare Diedje (Hadban Enzahi x Winarsad) left a large and successful family, but not at the stud itself. In 1973, four mares arrived at Kauber Platte that were to give the breeding programme an entirely new direction: the Tuhotmos daughters Hania (1971 x Hodhoda by Alaa El Din), Nana (1971 x Nazic by Morafic), Set Husen (1971 x Set Abouhom by Alaa El Din) and Moetazza (1972 x Aziza by Alaa El Din). 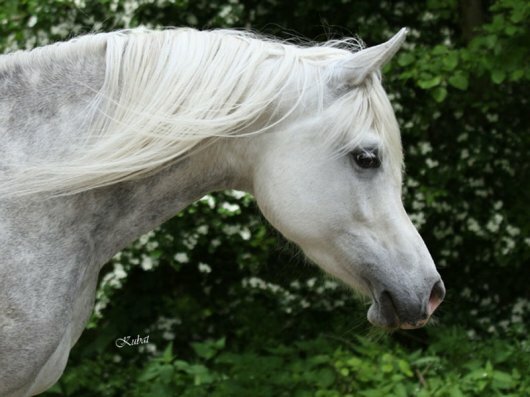 They became the true foundation mares of Kauber Platte Arabian Stud. Hania and Nana proved particularly successful and still have descendants at the stud today. 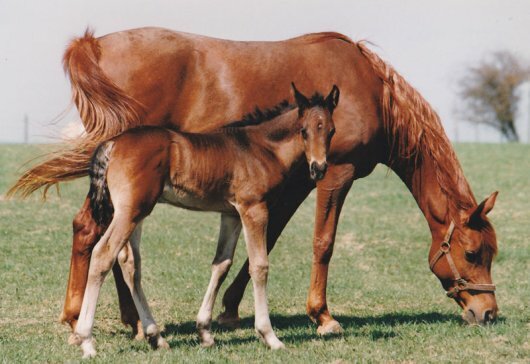 Set Husen's foals were all sold; of Moetazza's offspring, one son and one daughter were used at the stud for a time. Today, these bloodlines are only found in other breeding programmes. Both Set Husen and Moetazza have successful descendants in many countries in the world today. In time, several other Egyptian mares were added, two of which - Manaya (Madkour x Maisa) and Halima El Nile (Halim Al Kadir x Bint Bint El Nil) - have the largest groups of descendants at the stud today. Two other mares, Bint Alifa and KP Bint Tuhotmos, did not have a lasting influence at Kauber Platte. 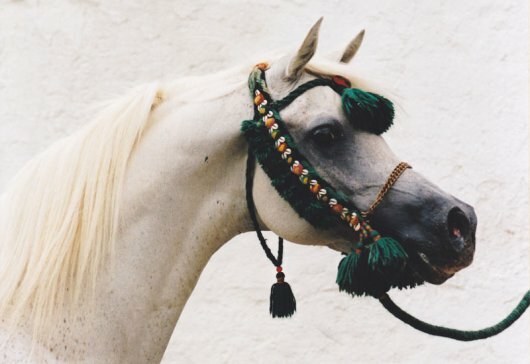 The first stallion to be used was the Nazeer son Kaisoon, who had given the stud a licensed stallion, Khalil (x Diedje), even before the programme was changed to straight Egyptians. Hakeel Ibn Kaisoon (Kaisoon x Hania) was the first Elite homebred stallion at the stud. He remained there all his life and has left two sons that replace him today. Other Egyptian stallions used were the imported Nizam (Shaarawi x Nazeema), who gave the stud several broodmares during the 80s, the Ansata Halim Shah son Motassem, and the black UP Sheitan (Mehanna x Sheykha-Abbayah), who still has a daughter in the herd. The most important stallion, however, was the imported Egyptian Idrees (Adeeb x Bint El Nil), although he left only 14 foals in the two seasons he stood at Kauber Platte. One can only speculate at the extent of his influence if his career had not been cut tragically short by a fatal accident at the age of four. Taking this into account, the extent of his influence is remarkable. The two sons and three daughters that were used at Kauber Platte alone would have ensured his place among the great sires of the 20th century. 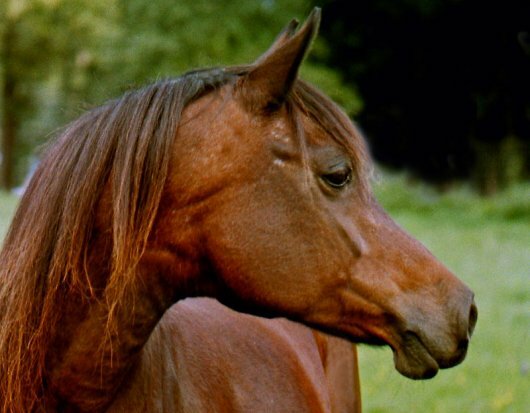 The Elite mare Hania was the most significant of the four Tuhotmos daughters that became the foundation of the stud in the 1970s. She was the only bay among the four half sisters, and probably the one that most resembled her famous sire. 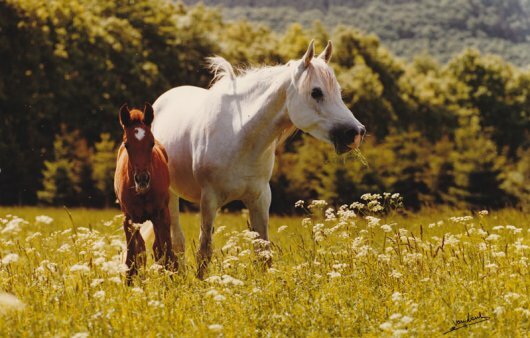 Hania had seven foals altogether, and only three of them were fillies, of which two were used in the breeding programme. The family of the oldest daughter, Bint Kaisoon, is found in the USA, while the second daughter Mageeda founded a large family in France. But Hania's greatest contribution to the breeds were her sons. Three of her four sons were used at the stud: Elite stallion Hakeel Ibn Kaisoon ( by Kaisoon) , many years chief sire and sire of the farm's current chief sire KP Mokeel; KP Malik El Nil (by Idrees) and KP Hadeer (by Moataz). KP Malikah El Nil, foaled in 1986, was Hania's last daughter and the most important one for the stud itself. 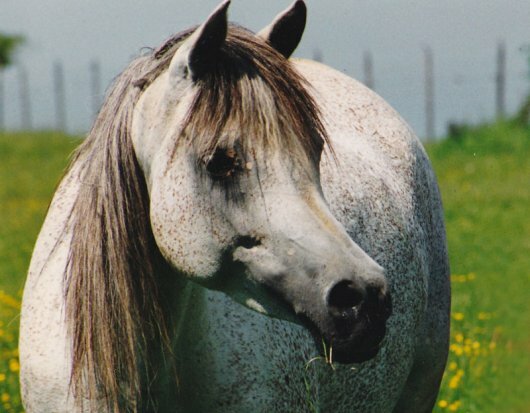 This extremely typey grey mare was surely one of the most beautiful daughters of Idrees, who died far too early. Her full brother KP Malik El Nil was foaled in 1985 and used as a sire for many years. He had inherited the copper bay coat of his maternal grandsire Tuhotmos and, like his full sister, was very refined and typey. 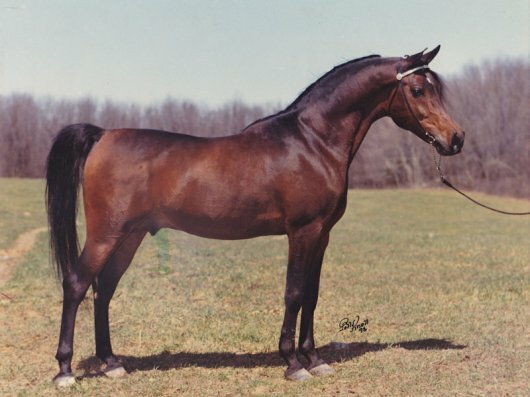 He sired many foals and was also used by Marbach State Stud several times. 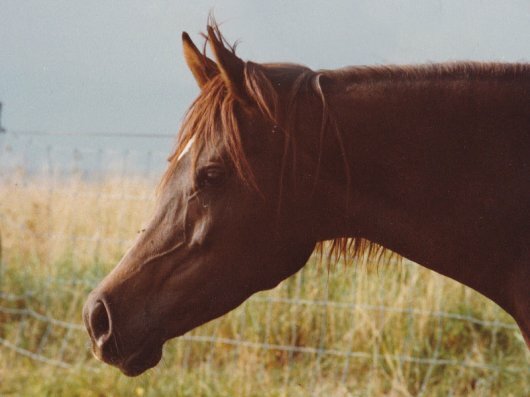 His daughter Mahra, foaled in 1994, is still in the Marbach broodmare band today. KP Ameena El Nil, foaled in 1998 out of Malikah El Nil, became her dam's successor at Kauber Platte. She is daughter of the black stallion U.P. Sheitan, but in appearance very much her dam's daughter. Together with two daughters, five-year-old KP Aleena (by KP Mokeel) and two-year-old KP Hodhoda (by Al Lahab), she represents the Hania family at Kauber Platte today. Nana was the only one of the Tuhotmos daughters whose dam was by Morafic rather than Alaa El Din, and it showed in her overall larger frame and longer lines. Her influence today is worldwide. Her firstborn daughter Naya (by Kaisoon) founded an entire dynasty in Switzerland, which includes successfulracehorses. The three quarter sisters Naama (by Mehanna) and Nathala (by Ibn Galal) were successful broodmares in the USA. At Kauber Platte, two Nana daughters, Naneeza (by Nizam) and Nameeza (by Idrees) joined the broodmare band. Naneeza's daughter Bint Idrees was sold to France, where her offspring include the successful show stallion Im Icara Cathare. KP Nameeza was one of the two Nana daughters that were used at the stud, and the only one whose branch is still there today. KP Nameeza, foaled in 1986, was by Idrees and, like many of his offspring, strongly stamped by her sire. In her younger years, she was shown successfully. For some years she was leased to Australia and left a very successful family there, including Simeon Setavi. 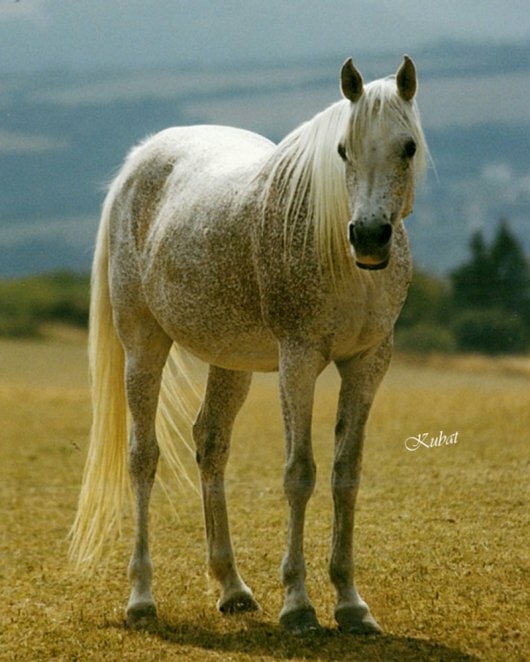 KP Naima, foaled in 1994, was the only daughter of KP Nameeza retained by the stud and is the only representative of the Nana family there today. She was one of the first foals by the stallion KP Mokeel, combining the foundation families of Hania and Nana with the newer family of Manaya. Great hope is set in her two-year-old son KP Al Nahim, by Elite stallion Al Lahab; a very refined bay colt whose first foals will be born in 2012. Manaya (Madkour x Maisa), foaled in 1977, was bred by Dr. Erwin Filsinger and came from the family of Moheba, one of the most influential dam lines in Egyptian breeding worldwide. She was a full blood sister to the influential Elite stallion Messaoud. 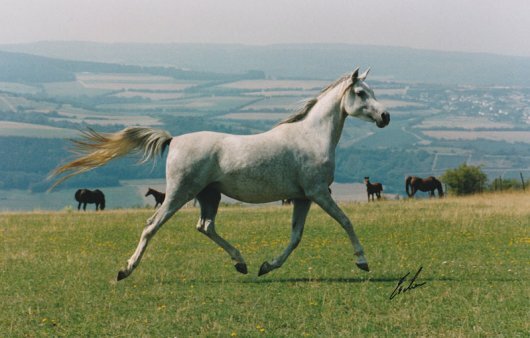 At Kauber Platte, she had five foals before being sold to Hanaya Arabians in Switzerland. Her oldest daughter Maseeda (by Nizam) was sold to France and has many descendants there. KP Mofida, foaled in 1985, was Manaya's last daughter at Kauber Platte and also the most important one. 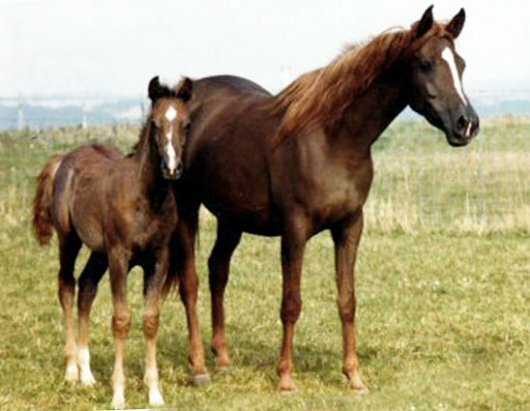 Three of her daughters joined the broodmare band, of which the eldest, the beautiful KP Bint Mohssen, had excellent foals both at Kauber Platte and later at Al Qusar Arabians. Two of Mofida's daughters and two sons have been retained. KP Mokeel and KP Maryoom. The 1996 stallion KP Mokeel (Hakeel Ibn Kaisoon x KP Mofida) is the current chief sire at Kauber Platte, together with his full brother KP Maryoom, foaled in 2000 (owned by Reinhild Moritz). There are also two full sisters, KP Maryana and KP Maryooma, who represent the Manaya family in the broodmare band. Both had fillies last year by the international champion and sire GR Amaretto. 2013 Maryooma's filly Maryam is by Ajmal Tameen. KP Maryana is in foal to KP Al Nahim. 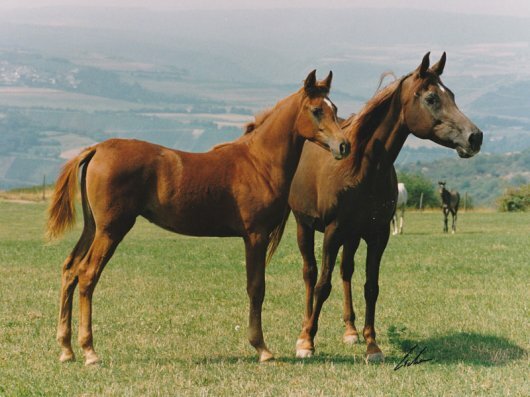 The chestnut Halima El Nile (Halim Al Kadir x Bint Bint El Nil) was foaled in 1987 at the Kübe family's Brigittenhof Stud. Her dam was a half sister to Idrees, being out of the great EAO mare Bint El Nil. She has given the stud four daughters, of which three are still at the stud today.